Rambutans are exotic fruits grown in tropical countries such as Thailand, Malaysia, Indonesia, the Philippines, and Australia. They are grown on a medium-sized tree, Nephelium iappaceum, which is related to the lychee. They are not exotic at all to the people of these tropical areas where they think of them more like people of northern climates think of apples. The name rambutan means hairy, referring to the spikes on the skin of the fruit. The spikes aren't sharp; they are fleshy and pliable. Like the lychee, under the rind, there is the tasty white flesh of the fruit and a single inedible seed. The fruit can be eaten fresh, without cooking. Most rambutans are red when they are ripe, but in Malaysia, you can also find a smaller, yellow rambutan. Rambutans grow in clusters on evergreen trees and are hairy-looking exotic wonders. 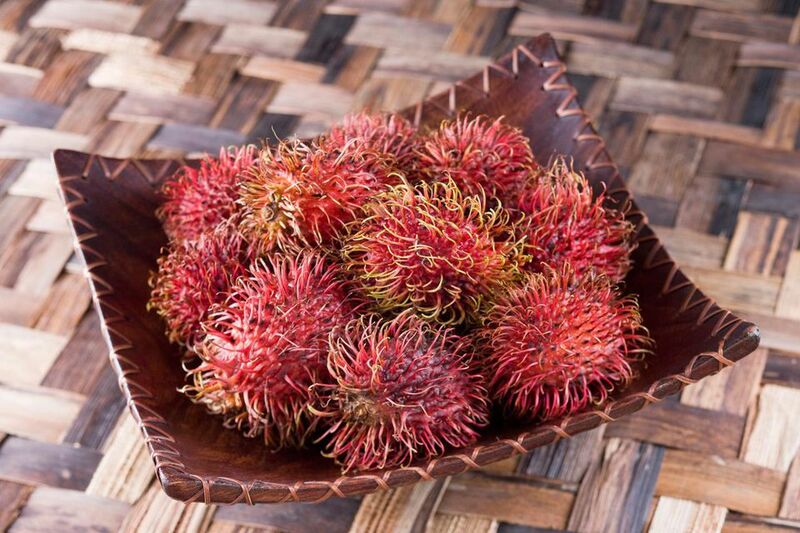 The flavor of rambutan is a little like grapes with a slight strawberry quality, slightly acidic and sweet. It has a pleasant fragrance that may be desired in some cooked dishes. It's not as sweet as the lychee and also is a little less acidic. Rambutans can be purchased in North America at Asian markets and Asian/Chinese food stores. Look for them in the produce section. When buying rambutans, look for bright red skin. A little orange or yellow on the skins in addition to red is okay, but green skins mean the rambutans are unripe. Don't buy rambutans that have turned black or have a lot of black "hairs," as this indicates they are over-ripe. If you need to store your fresh rambutans, wrap them in a paper towel and put them in a perforated plastic bag and store them at high humidity in the refrigerator. Don't peel them until just before you are going to serve them. Rambutans are high in vitamin C, plus copper, manganese, and trace elements of many other nutrients such as potassium, calcium, and iron. You shouldn't peel a rambutan until just before you are going to eat it or use it in a cooked dish. To open a rambutan, cut the skin with a sharp knife. Note that if your rambutans are very ripe, they can also be twisted open between your hands, and the fruit pops out. Now peel away the skin to reveal the beautiful egg-like rambutan fruit. Break or cut open the fruit to remove the nut-like seed. Most of the time it will come out freely, but some are clingstone. You can pop the whole fruit into your mouth and spit out the seed if you prefer and you're in the right setting. Enjoy eating your fresh rambutans as a snack or fresh fruit dessert. Like lychees and longans, rambutans make an excellent addition to a fresh tropical fruit salad. You can also find canned rambutans at international markets.